When I chose to travel to Namur I didn’t expect to completely fall in love with this beautiful charming Belgian town. I should honestly stop leaving parts of my soul in different parts of the world as they are calling me so often to return… My visit to Namur was full of exciting places to see and things to do so I’ve made a list with my suggestions for you. At the end of the tunnel, once I’ve made it out safe and alive (hehehe), I stepped into the old powder magazine of Namur citadel. The entire room was lighted by the flames of three candles sitting on a barrel – used as the tasting table. In the back of the room a mighty throne was built out of beer crates: “The game of beer” my guide told me, alluding to the iron throne from The Game of Thrones. 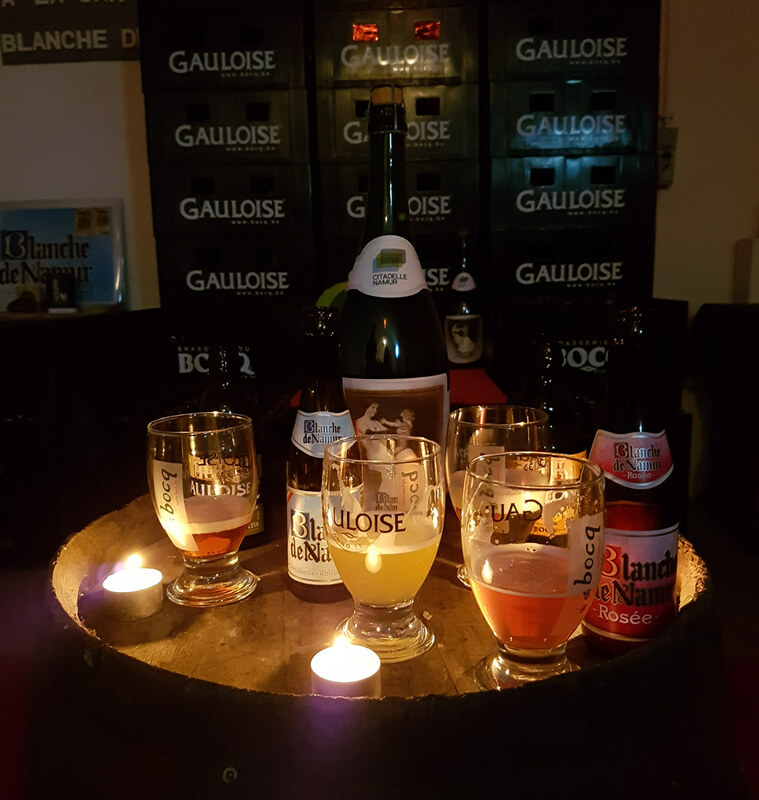 I tasted five different beers: Blanche de Namur, Blanche de Namur rose, Gauloise blond, amber and brune. They serve so many so that you can taste the differences between them. Blanche de Namur is the local beer produced by Brasserie du Bocq, in the nearby town of Yvoir. Blanche de Namur is a white wheat beer, smooth and mellow, very light. It was named after the daughter of John, Count of Namur, in the 13th century. She was so beautiful that the King of Sweden and Norway, Magnus IV Eriksson irremediably fell in love with her. They married and she became Queen over the two Scandinavian countries, which back then were united into one. It was fascinating to drink the beer and listen to the story of the inspiration behind its name. The citadel doesn’t do the beer tasting every day so if you want to experience it please contact them directly here. 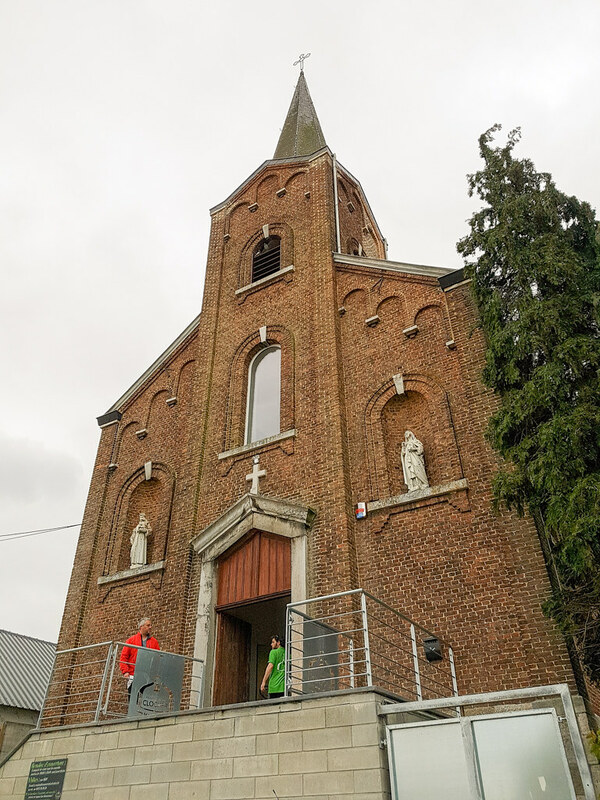 Just outside Namur, in the beautiful village on Malonne, stands an atypical brewery built inside a church. Brasserie du Clocher was born in 2015 from the passion of two friends, Alex and Jean. They have took over the Piroy church in Malonne, renovated it and created a mini-brewery inside. The entire project has been built by the hands of volunteers and even when I visited I have noticed how the locals were helping to bottle the new production line. 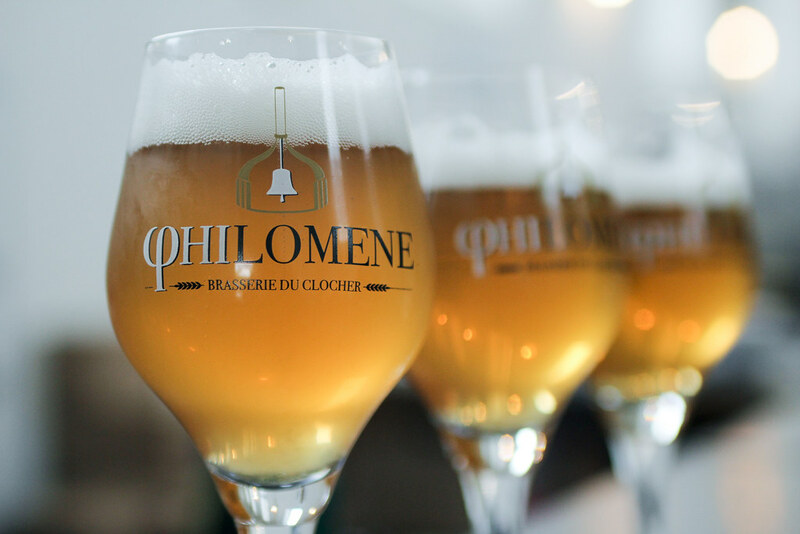 Brasserie du Clocher produces the Philomène Florale beer, blond and light, with flowery and citrusy scents. There are 4 different types of barley and 3 of hops that go into the composition of this beer, making it very refreshing. If you want to visit the brewery make sure you enquire (the website is in French) before about their opening times. 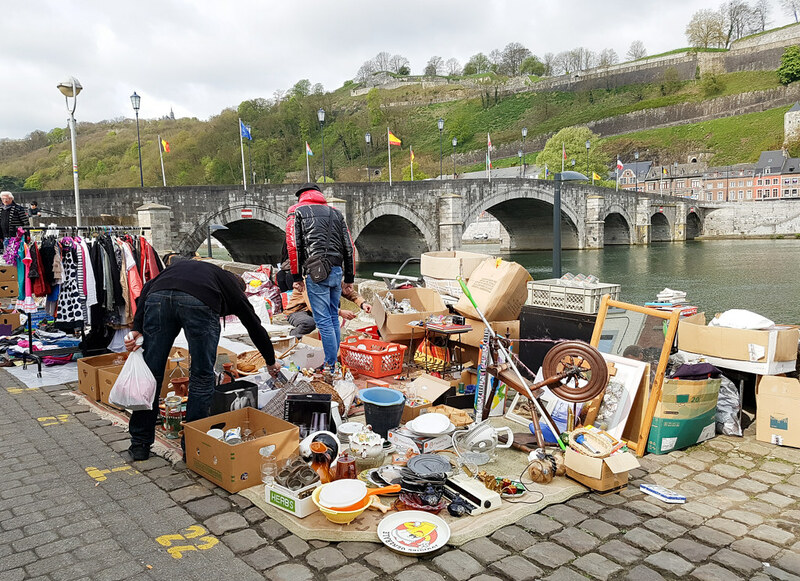 If you visit Namur on a Sunday, don’t miss a visit to the flea market next to James bridge. A lot of locals gather along the riverbank to sell their unwanted clothes, jewellery, records, books, toys and whatever else they don’t need anymore from their houses. I have always been fascinated by how other people live and I loved browsing through the boxes full of random stuff from the flea market. You never know what small treasure you can find. You know how they say, someone’s junk is someone else’s treasure. I could spot a few Tintin collectables sold for just a couple of euros. Tintin was one of the most popular European comics in the 20th century and today you can visit the museum dedicated to it, in central Brussels. 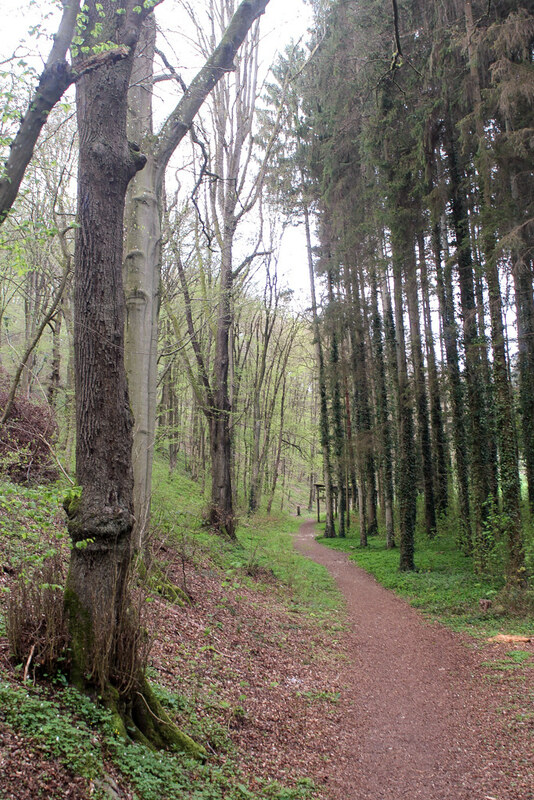 If you are traveling to Namur with your loved one you should definitely go to Bouge, a neighbourhood on the nearby hill. From up there you can enjoy a panoramic view over the city and the citadel. It’ is best to go there by night and watch the city lights, it’ a really romantic spot. I arrived there after the book scavenger hunt in the citadel ended and I was lucky to find one of the hidden books, carefully packed so it doesn’t get damaged by the rain and with a beautiful note inside it. I am planning to finish reading it, even if it is in French (funnily enough I can understand most of it) and then take it somewhere far away, in one on my next travels. The author of the note hoped the book will reach Paris. I promise I will take it much further than that. Probably the best way of exploring the charming valley of Molignee is by draisine. The railway crossing the valley has closed in 1962 and now the track is used for recreational activities only. 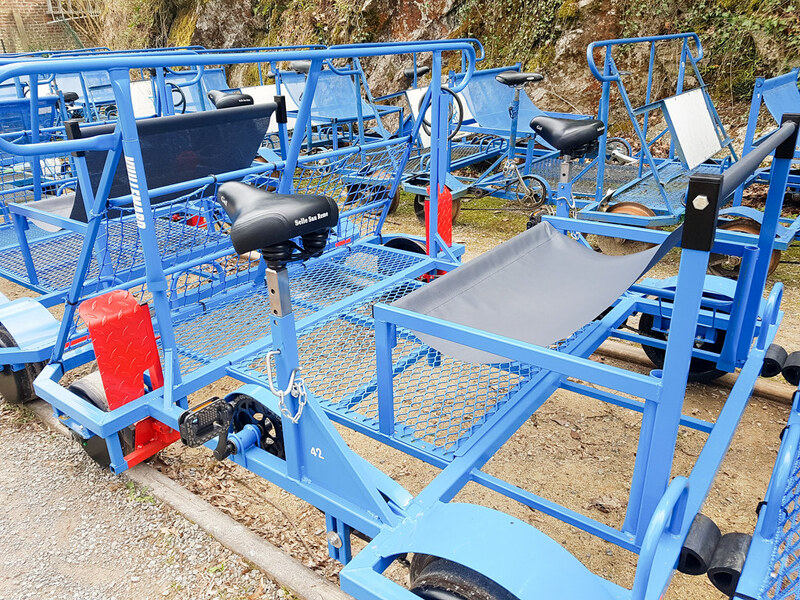 The draisine is a rail-cycle sort of bike propelled by human power, which can carry up to four passengers out of which two are pedalling in tandem. Think of it as a rail bike. We started our draisine adventure in the small village of Falaen, where we embarked on the 6km trip to Maredsous. We were told how long do we have until we need to return (there is only one track so you have to respect the timetable, as every few hours the direction changes) and off we went. The ride is very relaxing, climbing slightly on the way to Maredsous and all the way downhill on the way back. The scenery is very beautiful, crossing through tall forests and crossing bridges over tiny stone villages. 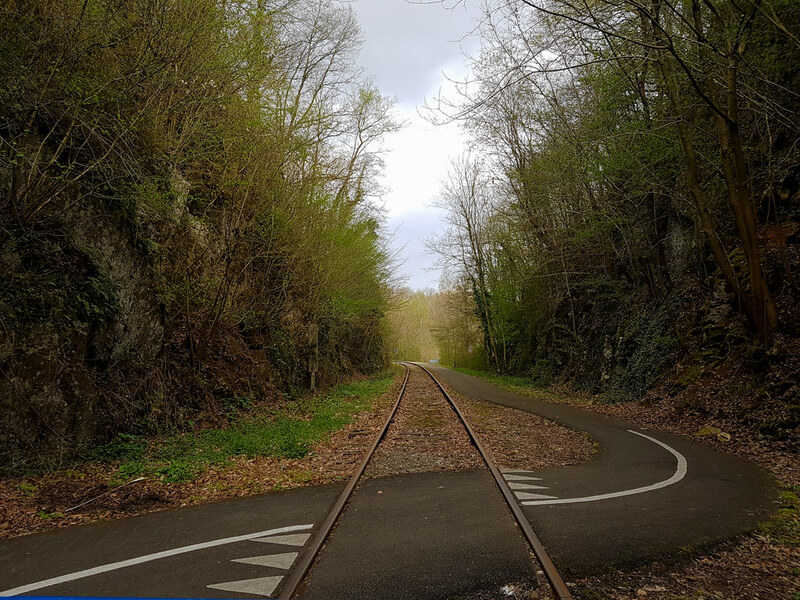 Once you arrive at the end of the line pedalling on the draisine, jump off, walk straight through the tunnel and follow the road towards the neo-gothic Benedictine Monastery of Maredsous. The path climbing up to the monastery is very peaceful, going through a forest along a river. 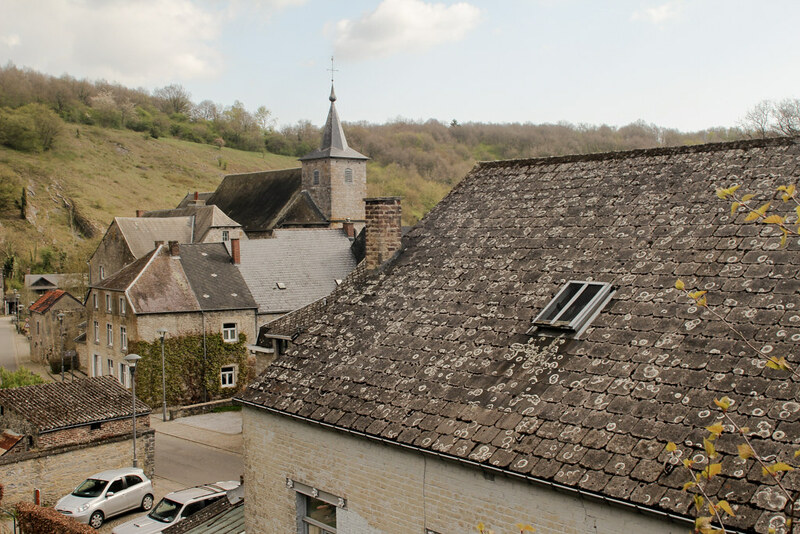 Maredsous is a monastery still run by monks who welcome their guests with a café where they serve their own beer and cheese, a bookstore and a visitors center. The monastery is also the home of a boarding school. During summer you can enjoy a guided tour of the monastery and get to discover the daily life of the monks. Did you know that just a few miles out of Namur there is a museum dedicated to strawberries? This is because the strawberries from Wépion are famous all over Belgium for their sweet taste and large size. During the season (late spring to the end of summer) you will find stands on both sides of the main road selling only the Wépion strawberries. And who doesn’t like strawberries, especially if they are sweet and juicy? The secret of the Wépion strawberries is that they are picked only when they are fully ripe on the vine, by hand, with a lot of care so that the fingers don’t touch the fruit. Strawberries have been grown here since the 17th century and are sold under the brand La Criée de Wépion. You can’t go to Namur and don’t save at least half a day to visit the charming Dinant, a town on the banks of Meuse river, about half an hour away. 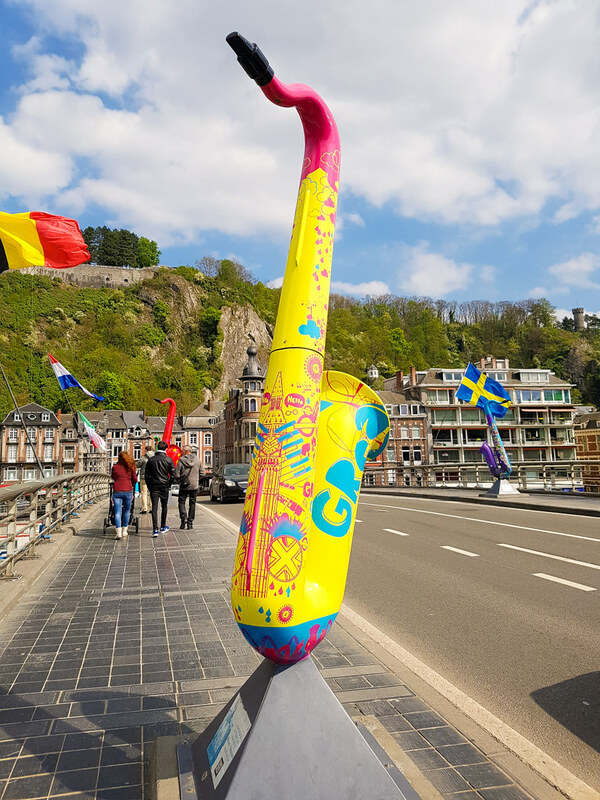 What you probably didn’t know is that Dinant was also the home town of the inventor of the saxophone, Adolphe Dax. 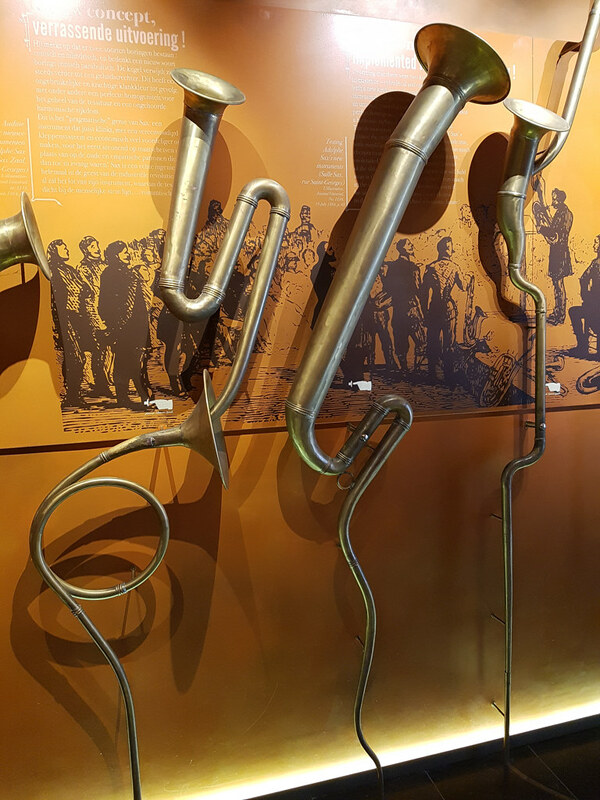 While strolling inside Dinant you must stop at La Maison de Monsieur Sax and enter the world of Adolphe Sax through an interactive exhibition of his inventions that led to the creation of today’s saxophone. At the entrance in the city, on Charles de Gaulle bridge, there is a collection of statues of Saxophones designed as a tribute to the European countries. Each saxophone has a different design and it’s fun to guess the country just by looking at them. While in Dinant don’t miss a visit to the Citadel, up the limestone cliff, guarding the city, where you can explore an interactive exhibition about the town’s role in the First World War. For a coffee with a view and a taste of the local cuisine, stop by Solbrun tea house. You will find here the Couque de Dinant, a honey flavored hard biscuit impressed with different motifs (mostly with the landscape of the town). If you feel adventurous, you can even go glamping on a boat in Belgium, an experience about which Paulina has wrote on her ablog. Disclaimer: This post has been written with the support of the Namur Touristic Office and the Citadel of Namur. I’d love to visit Belgium one day. I love the look of that flea market, so interesting to visit markets in other countries. Brewery inside a church, wow, I need to visit here! I also couldn’t help but imagine a big scary monster slug creeping down that tunnel. Ha-ha, one of those zany days haha. Namur looks like such a delightful and quaint city. I would love to visit Belgium one day. That flea market looks so fun! I’ve always wanted to find a really good one here in the UK – all the ones around us are definitely more charity shop boot sale than the cool stuff you see other people pick out from flea markets. Looks like you had a fab time, the beers look lovely! Namur sound such interesting town, that must have been quite an experience to go through that dark tunnel, frankly I wouldn’t have guts to go through it.. but i would definitely could spend whole day in the flea market and Dinant..
A brewery inside a church, now that’s my kind of church! I have only been to Belgium once, many years ago, when I was going to Paris for spring break in college, and there was an airport workers strike at Orly which caused our plane to be diverted to Brussels. I only got to spend a few hours in Brussels before we boarded a bus to Paris. I would love to visit Belgium on its own someday. I have no idea where Namur is but I’ll look at a map! Girl, you had me at drinking beer in an old cave and a church. I’m so there! Wow what some amazing things to do over there, I would love to visit the flea market I don’t know why I always get excited by that sort of thing. As a Belgian I get really excited when people talk about my home country! Belgium sometimes gets forgotten as a beautiful holiday location, not the best to get a tan 😉 but amazing to explore! For some reason the first photo reminds me of Willy Wonka and the chocolate factory lol. I love it! It sounds like there is a lot to do in Belgium, I would definitely hit up that sunday flea market! What a gorgeous little town and so much to do too! I love unique places like this with lots of unusual things to do and see! My daughters have both been to several places in Belgium but this sounds so unique. I cannot wait to let them know that there is an opportunity to have beer tasting in a Church! Well now I want to visit Namur! Seems like a cute little place that one can do a lot in. Thanks for sharing tips and advise! You had me at beer tastings and flea markets. I have never been to Belgium but – and I’m not over exaggerating – your blog has moved it up on my bucket list. What a cool little town and your suggestions on activities (and the photos) are so helpful and fun. 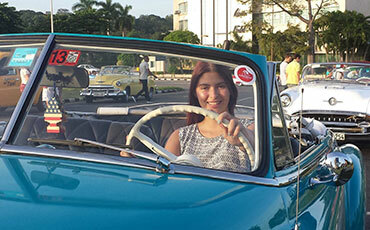 This sure looks like an amazing experience that you can’t have in any other place of the world. To be honest, if I could only visit one of the places you mention I don’t know which one to choose! All of them look so cool! But maybe, just maybe…. I would choose the beer tasting at the tunnel… I love Belgian beer! Oh how beautiful are those colourful saxophones? Also I would love to taste the strawberries of Wépion, I love that there is a museum dedicated to strawberries and that everything is handpicked! You captured some great shots! The city appears so rich in history and local stories. 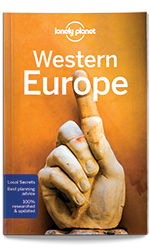 Such great tips and thoughts for future travelers! Drink a beer while you pray I guess in Belgium. It seem like such a different place to visit. I love to travel outside my normal day to day life. I’d love to visit Belgium! Namur seems like a wonderful town with so much to do. I didn’t know Belgium had flea markers too. I bet there’s so much interesting stuff! I want to do everything on this list! I had never even heard of Namur but now I think I just HAVE to go! The bee tasting in the tunnels sounds like a phenomenal experience. Wow, the Citadel and the brewery inside a church sounds like unique experiences. The tunnels do look scary but the set up inside is pretty amazing. I have never heard of any thing as rail bike, sure it is super fun way to explore a new place. Wow, the tunnel beer drinking trip sounds like a blast. I would love to experience it. Wow so much to see and do! My son visited Belgium last year with the Scouts and he loved it. I love the idea of the rail bike…looks great fun and would be fascinated by all those saxophones! I used to play sax as a child! This is where my family are from, but I haven’t been back in about 25 years. I would love to go again. I’d definitely love to visit this beautiful place, especially walk through that tunnel! Wish I had such privilege to travel round the world or most part of it. I’ve unfortunately never made it to Belgium but I’ll have to add this to my list for when I do! The underground tunnel looks so cool. 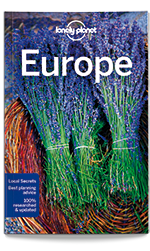 I love finding out about new places to visit, especially when they’re not just the main or capital city of a country. I have never even heard of Namur and you make it sounds so awesome! I will have to check it out since Belgium is on my bucket list! I have heard a lot about beer tasting within the tunnel, and can’t wait to try it out. Besides that, I could easily spend more than half a day at the Sunday flea market. Great post. Cheers!! 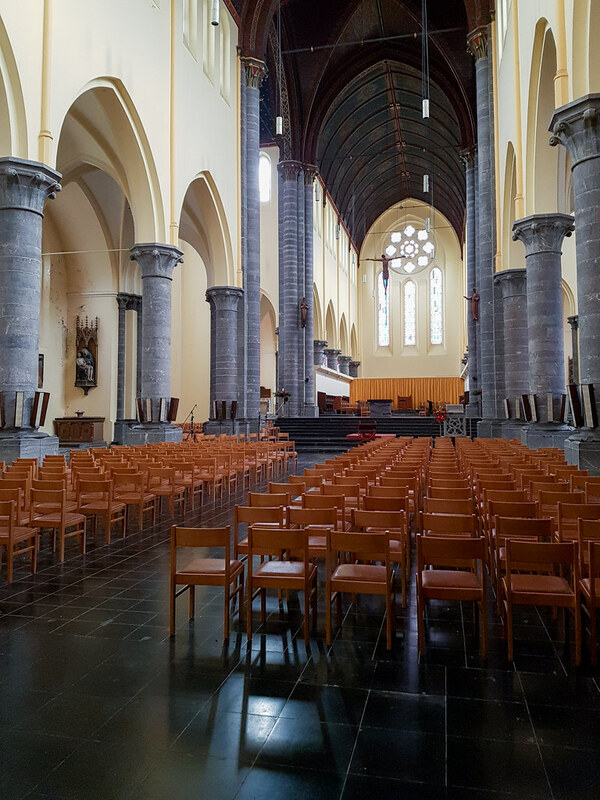 Such a great list – I visited Ypres and Diksmuide (I think that’s how you spell it!) over ten years ago and had such a great time that I really must go back one day! I do love strawberries. Wow a museum sole about strawberries now that is unique and probably fun to visit too!!!! What an interesting place! I’ve never heard of it before. Last year we were in Mechelen in Belgium which I fell in love with (having never heard of it before that!) so I might have to put Nemur next on my Belgian travel list. 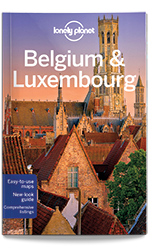 I would love to visit Belgium one day, I’d not heard of Namur but it sounds a great place to visit. Those tunnels looks so spooky but definitely worth it for the Belgian beer at the end. I have never heard about this place before. I hope I will have the chance to visit it one day since I love exploring hidden gems. I hadn’t even heard of this town before today and now I want to go there. Thanks for the recommendations. I have not been to Belgium in many years but when I make it there I will try and check it out. A stunning town, and one I’ve never heard of! I’d love to try the beer tasting in the caves, it looks so cosy, and very Game of Thrones-esque! The colorful saxophones would be great to photograph too. Thanks for sharing this post on a new place to me! I have never been to Belgium let alone Namur. It looks like a lovely city. The art, the houses, the experience. Beer tasting would be so much fun! I remember having one of those when I was living in Scotland! What a great place to visit! A brewery inside a church is so unsual, I’ve never seen that before! Sounds interesting! I love Belgium but even though I’ve visited quite a bit, I’ve never been to Namur! That will go onto my next visit. My daddy would love to do the beer tasting but not too sure you’d get my mummy down those tunnels. What a fascinating stay you had! I haven’t traveled much so this is the first time I’ve heard of this Belgian town. It sounds so interesting and unique – I do know what you’re talking about when you say leaving a part of your soul in a city. I’ve had those times in my travels too, that feeling when you feel so at home that you don’t want to go home. That citadel tunnel and beer tasting experience is so cool! That draisine adventure is so cool and a great way to explore the outskirts of this charming town! These pictures are beautiful. They look like a cross between Peter Pan and Harry Potter meets adults having a beer. LOL. It looks like you had an amazing time! I literally just got back from Belgium two weeks ago and want to all of the places you did, but Namur. After reading your post I definitely missed out! But, I did visit Dinant and went to the saxophone museum and went on a beer tour! Glad you enjoyed it just as much as I did! Looks like a nice, peaceful and picturesque place to visit. Great post and photos. I cannot believe I haven’t ever read about Namur before. It is such a cute place. 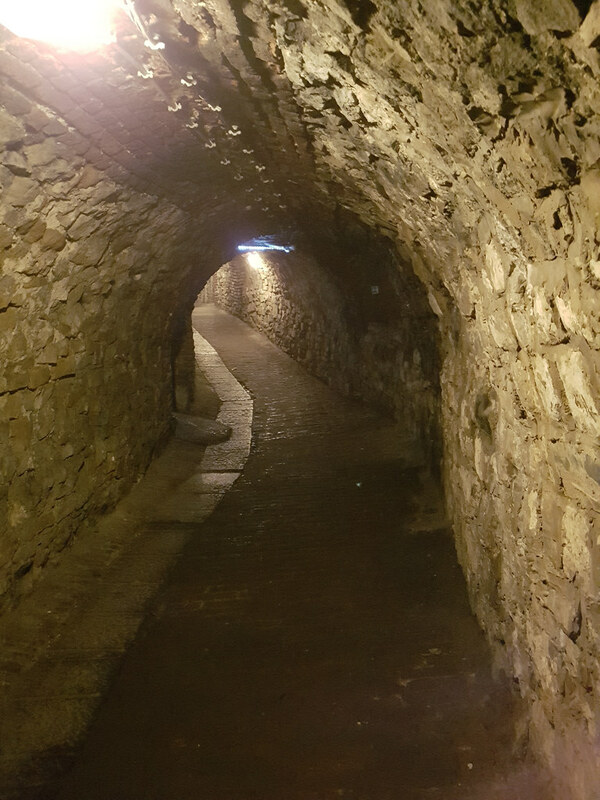 The walk through the tunnel of the citadel to taste beer must have been so fascinating. The best part about your article was reading about the draisine. I would love to ride the draisine someday and meander through the woods of Namur. I’ve never heard of Namur despite visiting Belgium many times. The beer tasting in the Citadel tunnels sounds like a unique experience. You’ve taken some wonderful photos of Namur, especially the beer photo. I like the used goods market you can find there useful staffs also the atmosphere in Belgium looks awesome I really wanna give a try the belgium beer. 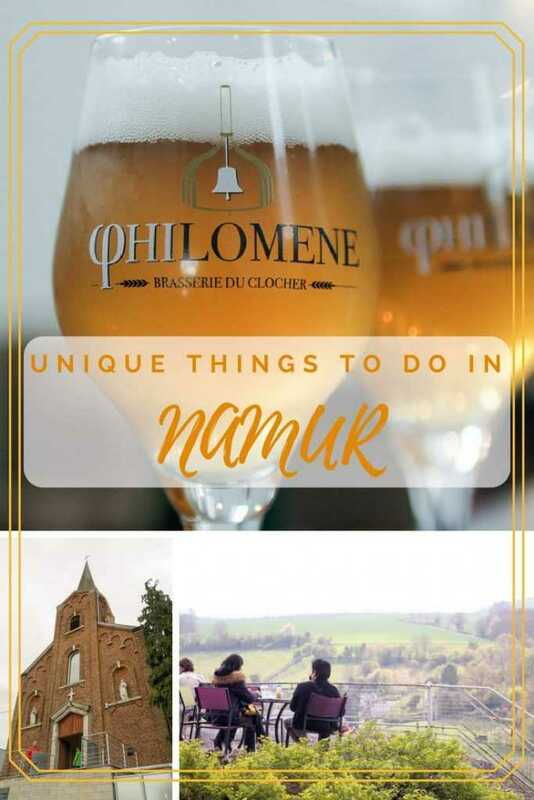 never heard of namur actually – but i am glad you have showcased all this information – hidden gems like these can’t stay hidden for long!!! i would love to go to the tea house…that view ! What a gorgeous place to explore. 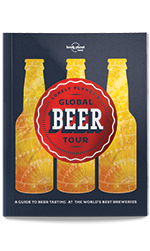 I’m not much of a beer drinker but even I would have fun trying and exploring these beers! Belgium has never been on my list of places to visit but after reading this I might have to add it. It sounds amazing! Wow whole lot of unique stuffs to do! The beer trail sure sounds fun. And those saxophones are so colorful and interesting. It surprises me that they are left in the open. Won’t the colors fade away. The souvenirs here must be little saxophones. Such a beautiful place! I’m adding this to my bucket list. Love all the amazing photos. Wow, that starberry museum is impressive! Would love to visit there. You have captured the feeling in such a great way. 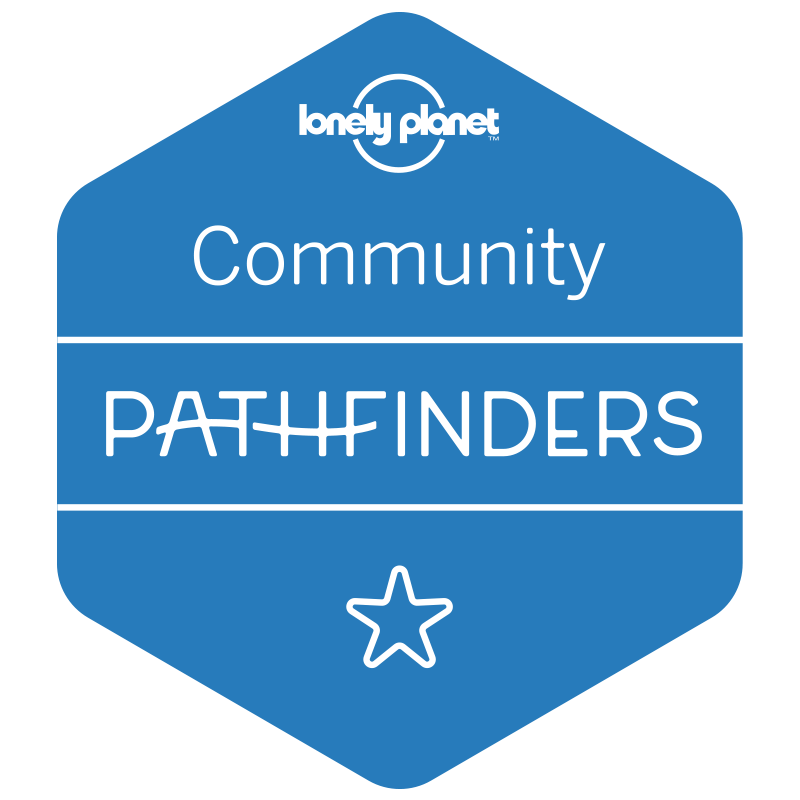 It’s funny – I had never hesrd of this place but now I feel like I’ve been there, thanks to you! OMG why have I never heard of Namur! It looks like there are some fun things to do there. Namur is such a small and beautiful town of Belgium. Not many people about this. But I like such small European towns for idyllic vacations. Also I would like to visit the birthplace of Saxophone – my favorite musical instrument. I would also like to go upto Citadel for the stunning view of whole town. Such great adventure. When I traveled with my family last two months ago, I also went through boxes of stuff just to find something worth my dollar. Perhaps that’s the excitement of travelling. You would want to bring a nice piece of that place to your place. But seriously, Belgium seems to be a nice place to consider visting and exploring. So many things and adventures to do in Namur! It is such a wonder that people like you support your own tourism there. I really find it a great thing! The flea market got my attention the most! It’s true that your junk could be somebody else’s treasure. Hey, these are excellent activities for every visitor to Namur. I personally like the beer tasting, strawberry tasting (all the tasting activities, haha), and the flea market activity as well. As far as I know, Belgian beer is very popular, so I’d like to taste it once I’m in Belgium. The city of Namur looks amazing, and it surely is worth anyone’s visit. Hope to have the opportunity to research it on my own. Namur look like a beautiful place to visit in Belgium.I was there last year and visited Bruge and Brussels. What a fun town to spend a weekend at! Those weird saxophones look so interesting. I would love to look through that very cool looking flea market and try all those beers! I love to visit here one day. I specifically love the flea market more than anything you posted. haha. Kidding. All the places really looks remarkable and I wish to learn more on their culture. I would love to bring my family there and stroll around the place. What a stunning place – I love the idea of searching through the flea markets and a museum dedicated to strawberries sounds not to be missed! This is simply amazing. Such a beautiful place! Wow! Good to know that you had such a great trip. What? A church was converted into a beer shop! Ha ha, the conservatives will surely not like this development but this is what life is about? Have fun while we are alive, isn’t it? I would love to know the camera that you are using, the photos are just brilliant. And to have beer inside those tunnels is absolutely adventurous. First time I read about Namur. It is really wonderful seeing those identical houses in the community. It looks as if it is a village that was constructed by a specific developer, which I guess is not. I am interested with the flea market. I wonder if I could find Jimmy Choo or Louboutin shoes there like the “ukay-ukay” place I usually visit in our place =). 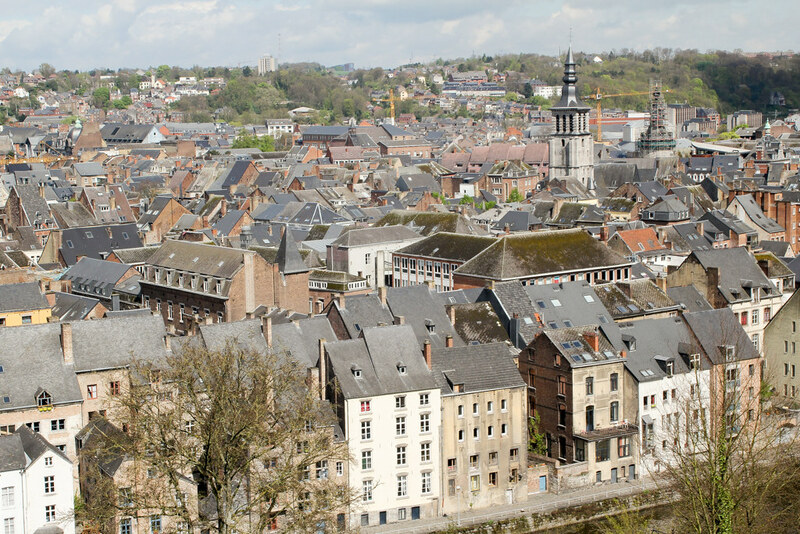 Based on your photos, Namur seems a very friendly and peaceful place where the attractions are not too crowded. Do you plan to visit any other cities now? 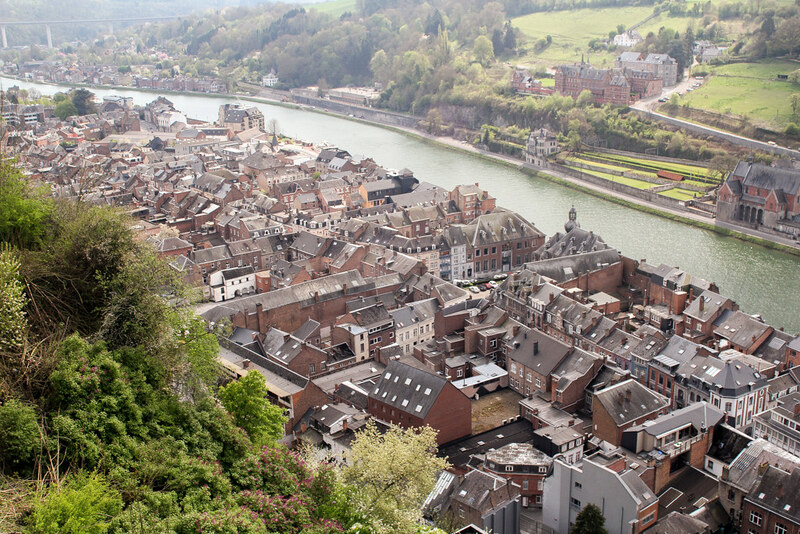 Wow Namur looks like such a fantastic place to visit, and what a lot there is to see and do! I love exploring places like this, I feel sad that we haven’t travelled as much as we would have liked to, another for the list though!